Download Apowersoft Video Converter Studio with full free license key on this offer. Apowersoft offer free solution for a time limited to get genuine license key for free. Normal price Apowersoft Video Converter Studio lifetime registration code is $79.95. Now it free and the license key given is unique for everyone. Apowersoft Video Converter Studio competitive solution for MacX Video Converter Pro. A hundreds of video & audio formats supported by the software. 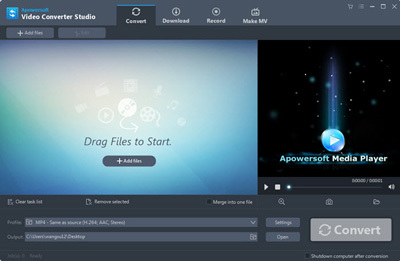 The tools on Apowersoft Video Converter Studio is video converter, downloader, and recorder. The software also allows you to edit, cut, trim, or merge videos. For users who interested to download Apowersoft Video Converter Studio with genuine license key, visit the giveaway page. Apowersoft Video Converter Studio Giveaway page: Visit the page! Follow the instruction describe on the free offer page of Apowersoft. This giveaway is available for one week only. Visit the giveaway link above. You may need a social network account to unlock the registration form. Fill up all field on the online form then submit. The license key code will be sent to your your email box after submitted the online form on the giveaway. If you can’t receive key code within 10 minutes, check your spam folder or contact apowersoft.com support to get new license key. The features of Apowersoft Video Converter Studio giveaway version is not complete as paid version. It without online video downloader and slideshow maker. The paid version is available with up to 60% discount. Get best deals for $55.95 instead of $129.90: Click here to buy! Buy Commercial version of Apowersoft Video Converter Studio: Buy now! The commercial version also can use the same coupon. Earn 60% off discount for full lifetime license key of Apowersoft Video Converter Studio.